Yorkshire pudding is a common English side dish consisting of a baked pudding made from batter consisting of eggs, flour, and milk or water. It is a versatile food that can be served in numerous ways depending on the choice of ingredients, the size of the pudding and the accompanying components of the dish. As a first course it can be served with onion gravy. For a main course it is often served with beef and gravy and is part of the traditional Sunday roast, but can also be filled with foods such as bangers and mash to make a meal. Similar instructions were published during 1747 in the book The Art of Cookery made Plain and Easy by Hannah Glasse, with the name 'Yorkshire pudding'. It was she who renamed the original version, known as Dripping Pudding, which had been cooked in England for centuries, although these puddings were much flatter than the puffy versions made today. William Sitwell suggests that the pudding got the name 'Yorkshire' due to the regions association with coal and the higher temperatures this produced which helped to make the batter crispier. Originally the Yorkshire pudding was served as a first course with thick gravy to dull the appetite with the low-cost ingredients so that the diners would not eat so much of the more expensive meat in the next course. An early recipe appeared in Sir Alexander William George Cassey's The Whole Duty of a Woman during 1737. Because the rich gravy from the roast meat drippings was used up with the first course, the main meat and vegetable course was often served with a parsley or white sauce. In poorer households, the pudding was often served as the only course. Using dripping, a simple meal was made with flour, eggs and milk. This was traditionally eaten with a gravy or sauce, to moisten the pudding. The Yorkshire pudding is meant to rise. The Royal Society of Chemistry suggested in 2008 that "A Yorkshire pudding isn't a Yorkshire pudding if it is less than four inches tall". Yorkshire pudding is cooked by pouring a batter made from milk (or water), flour and eggs into preheated, oiled, baking pans, ramekins or muffin tins (in the case of miniature puddings). A basic formula uses ​1⁄3 cup flour and ​1⁄3 cup liquid per egg. Water produces a lighter crisper but less sweet pudding than using milk. They can also be baked in the oven in muffin tins. A 1926 recipe involves covering the pudding with greaseproof paper to steam it and then serving it with jam, butter and sugar. Other foods made from batter include popovers, gougère (a savoury pastry), Dutch baby pancakes, toad in the hole, and takoyaki (a Japanese puff batter dumpling with octopus). National Yorkshire Pudding Day has been celebrated on the first Sunday in February in Britain since 2007. It is celebrated on 13 October in the United States. ^ Siciliano-Rosen, Laura (22 October 2014). "Yorkshire Pudding". Encyclopaedia Britannica. Retrieved 2 July 2018. ^ Lady, A; Kenrick, William (1737). The Whole Duty of a Woman. London. pp. 468–9. Retrieved 7 December 2017 – via archive.org. ^ Sitwell, William (2015). A History of Food in 100 Recipes. William Collins. p. 136. ISBN 978-0-00-741200-6. 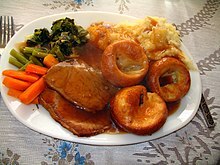 ^ "Old England Traditional Roast Beef and Yorkshire Pudding". food.com. Retrieved 15 October 2015. ^ "Secret of a perfect Yorkshire pud". BBC News. 14 November 2008. Retrieved 14 November 2008. ^ "Yorkshire pudding must be four inches tall, chemists rule". Royal Society of Chemistry. 12 November 2008. Retrieved 8 January 2014. ^ a b Clay, Xanthe (30 January 2015). "Yorkshire puds aren't just for roasts – they're a cracking dessert, too". The Daily Telegraph. Retrieved 20 December 2017. ^ "Best Yorkshire Puddings". BBC Good Food. February 2009. ^ "1926 Recipes – Puddings and Pastry". Recipes Past and Present. Retrieved 16 May 2018. ^ "National Yorkshire Pudding Day: 9 delicious and easy yorkie dishes to blow your taste buds". Metro. 7 February 2016. Retrieved 20 December 2017. ^ "Don't get in a stew about Yorkshire puddings: Find out everything about the delicacy". Sunday Express. 4 February 2016. Retrieved 17 May 2018. ^ "National Yorkshire Pudding Day – Sunday 4 February 2018". Yorkshire's Best Guides. 29 January 2018. Retrieved 17 May 2018. ^ Lemoine, Yvan (2010). FoodFest 365! : The Officially Fun Food Holiday Cookbook. Simon and Schuster. p. 39. ISBN 9781440510007. Retrieved 20 May 2018.